BRING YOUR BOAT AND ENJOY THIS CRYSTAL RIVER WATERFRONT HOME ON .54 ACRE! 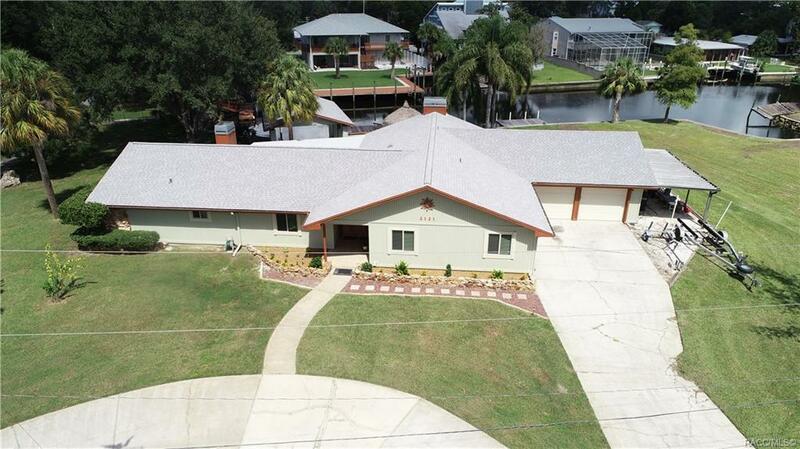 This is a Beautifully Remodel 4 Bedroom, 3 Bathroom, 2 Car Garage, 1 Car Carport Home with over 3000 Living Sq Ft. This Home has 2 Master Suits, Living Room, Family Room, Eat-in Dining Room, Formal Dining Room, Large Kitchen, Florida Room, Quartzite Counters (2018), 15 Seer Trane System with Halo duct purification system (2018), Roof (2017), Dual Pane Windows (2018), and Floating Dock, and Large Covered Boat House. Take a Boat Ride Down the Large Deep Canal to Open Waterways on Crystal River; Enjoy the Sunset on your fishing travels to the Gulf of Mexico Waters. View the Manatee at the Famous Three Sisters Springs thru the Crystal Clear Water.